Today we have added to the Members Only Page for your viewing enjoyment an Action Shooing Tip, in which Long Hunter discusses Rifles and also a Mounted Shooting Tip in which Morning Dove talks about the proper way to enter the course of fire. 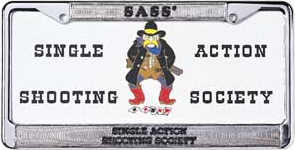 Today we also have the SASS License Plate backing stock. We have been out for a while but are now back in in time for Christmas. Click on license plate to order.